Royal Enfield has given all bike lovers a reason to smile by launching its “Thunderbird”. The bike has quickly become synonymous to powerful performance, great comfort and elegant looks. The bike has also won the “Best Cruiser Award” from BBC wheels. Royal Enfield Thunderbird has been launched in many vibrant shades. The bike has minimum graphic display and the fuel tank extensions are absent. Loads of chrome has been used to style the bike. The broad headlights and the bulbous fuel tank give a classic look to the bike. The elegant taillights are eye catching. 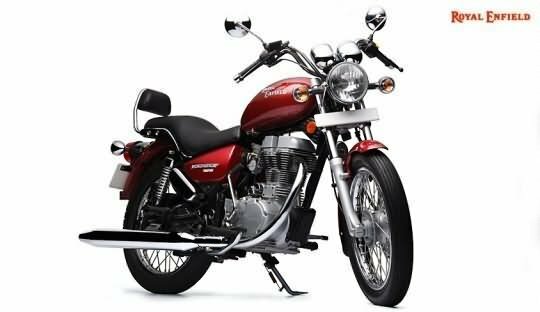 Royal Enfield has succeeded in providing a classic look to the bike. Tacho Meter, Analogue -1 Trip Meter, Analogue Speedometer and Passenger Backrest. The one piece stepped seat gives much needed comfort and firm cushioned backrest makes it better for the pillion rider. Safety has been given utmost importance in Royal Enfield Thunderbird. The front suspension of the bike has hydraulically damped telescopic forks while the rear suspension is outfitted with a swing arm with five way adjustable gas shock absorbers. The high quality suspensions ensure comfort, stability and safety. The bike has 280 mm Hydraulic (front) disc brake and 6” Internal expansion drum (rear) brakes. Royal Enfield Thunderbird has 346 cc, 4 stroke, air cooled, single cylinder, OHV engine. It churns a maximum power of 18 bhp at 5500 rpm and a maximum torque of 27.5 Nm at 3500 rpm. The engine is linked to five speed gearbox. The price of Royal Enfield Thunderbird is Rs.109000 (taking Mumbai as base price location). However, the price specified is indicative price only and reflects lowest approximate price which excludes tax, registration, insurance and cost of accessories.